As I said in my previous vlog, I am involved in a big lego project, which take me lot of time. Therefore, I though I would not be abble to build something during month, or just finish a creation. But I was wrong, I have finished this moc ! 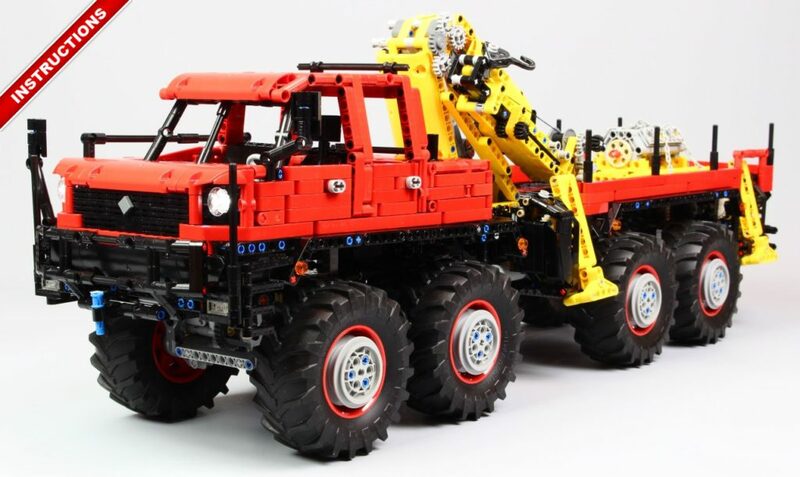 This model is a lego technic 8×8 offroad vehicle, inspired by low ground pressure articulated truck like Foremost or Rolligon, equipped with a crane, outriggers and non symmetrical cab. The idea was to used the big lego tyre from Xerion, combined with a small scale, would give a truck with giant wheel to give the impression of strength and power. Of course this is just an impression because with the weight and the many functions in it, the goal was not to make trial truck competition. I wanted to focus on playability with the operating crane and outriggers and articulated steering plus the adding of sbrick to control with my smartphone which is handier that the IR (and now the sbrick works for me, so I use it). The drive are operated by two XL motors, one on each axle which drives 4 wheels. The axles are equipped with differentials but not central differential because it doesn’t need it as the steering is in central articulation. As the wheel slipped when the steering is operated, it was important to have differentials on each axle. The global gearing is 12/36t then 24t/differential and 8/24 in portal hub. Therefore the truck is quick fast for its size but have not many torque on the wheel. The front wheels are connected to the L6 fake engine thanks to a chain. the engine is placed on the side of the cab, underneath a articulated hood. That was a configuration that I have seen on some Russian trucks when either the engine is big, or the items transported are long (they are placed consequently on the side of the cab) and wanted to reproduce it. The steering is a articulated steering which is operated by two linear actuators driven by a L motor. The force of the linear actuators are needed to move by pushing and pulling each side of the articulation. The attachment of each linear actuators are made on a line which cross the pivot point, enable to have the same displacement of each actuators to some point. After 3/4 of travel, the angle between the line and the actuator tends to slow a actuator and speed up an other, but the linear actuator are equipped with internal rotating clutch which compensate this movement, and generate some clicking that you can hear on the video. The suspensions was the main innovation of this creation for me. Because it is composed of leaf spring double suspensions. Each wheels of each side are connected, two by two. This is made by linking the axle from same side using lego axle on oscillating point. As this axle can be bend over the weight or terrain, it gives the suspensions effect as a real leaf spring. The axle are simple connected to the frame with a ball-join, and two connecting rods connect the axle to the oscillating point of the leaf spring on the frame. There are just 4 small spring from lego shock absorbers mounted to rear and front wheel to support the weight of the rear and the front. But as the spring can slide on the axle, it is only used when the suspension axle is in the end of movement enabling to support the weight without altered the functioning of suspensions. The outriggers are a function that I love. I wanted to reproduce outriggers on this truck, especially because as it is an offroad truck, it needs outriggers to stabilize the crane. Of course here in lego the outriggers do not lift the truck, but the functions are really cool and useful. At the beginning I wanted to use the linear rack and worm from new 2018 sets (like the Mack 42078) in order to have a lifting force and compact solution. But this solution was way too big, and therefore the stabilizers was to big to fit front and back of the rear axle. That is why I have chosen a more classic stabilizers form with parallelogram linkages. The four outriggers are operated by a M motor located in the rear, with independent clutch on each outriggers in order to adapt on ground. The crane was based on the #8258 one with small modifications. It is composed of 3 sections operated by two linear actuators and by hand. There is one motor by linear actuators, one L motor for raising the first section and a M motor for the second section. the last section, as the winch, is operated by hand. The modifications was only for increasing the speed for easy playability, and some reinforcement about the frame and design. The last motor on this crane is a M motor which operates the turntable which is quite slow but better for fine positioning. Of course the pull force is not very important, especially when the last section of the arm is out, but the main goal was to have accurate control and speed for playability. The last subject was the design and details. I wanted to reproduce the force and strongness of a big and powerfull truck, that is why I chose a small scale compare to the wheel, with details such as mudguard, front bumper with placement signal rod suggesting the off-road capabilities of a real machine. The round shape of the front and cab and rear hood is from old truck inspiration like 60’s or 70’s. The model is equipped with two pair of light, for front and rear light which is turn on with the sbricks. The battery box is located underneath the big hood at the front back to the cab. This hood has also some detail like exhausts and filtering unit. The two doors can be opened, to reveal a detailed interior with seat for driver, bench seats for other passengers, and dashboard with steering wheel which is not linked to the steering due to the scale. There are two fuel tank on each side, which also paneling the mechanism of outriggers. And at the back, there are some detail with the rear bumper and a crane remote attached. But I have to say, that, to contain the weight and have a low profile on the back, I couldn’t make the whole paneling of the rear, which display the mechanism. which is not bad for technic (I like seeing mechanism) but less homogeneous with the full panelling on the front part of the truck. To conclude with the climbing abilities : there are not. In fact even with the two XL motors and the suspensions, the model is too heavy and not designed for making trial truck. It works fine on flat surface but on rough surface the speed is too important and if I reduce the speed, the U-join located in the ball articulation of the axle are broken even with the portal hub (which reduce the necessary torque on U-join by increasing torque after the U-join on the wheel). It is also obvious that the articulated steering is not the best option for steering abilities in trial truck (because it generates bad mass distribution at full steering). The goal here was the playbility, that is why I have made choices in consequence. At the end, the model is very playable, with many functions and operating crane, nice design, and some details to play with it. It was not the most difficult creation I have ever done, even if the cab, chassis and the design made me some headache but definitively one of the biggest I have created, and one of the most playable and fun to construct. As usual I have made a photo sequence instruction. This not a proper building instructions, as the moc is quite complex and there are many parts, but plus a dismantling photo sequence which is enough to rebuild it if you are enough skilled. Please note that this truck is not made for trial truck and regarding the weight, it has to be operated on flat surface only. Want to know if you can build the articulated 8×8 truck ? The articulated 8×8 truck has been indexed to rebrickable, check it ! That model must have taken a long time to create! Articulated steering is simpler and tougher than regular steering, but it does not help with weight distribution. I would build if had all of the parts. I like making things with good suspension, steering, and durability. Cannot wait to see your next model! Hi! Can you tell me at the slide 201, which motor are connected to which port of the sbrick? I like this MOC very much!Do you have a spare part list?